You're at an estate sale. It's hot. There are lots of things you would like to buy, but they are going for too much money. You are just about ready to call it a day so you can go home and pour a bucket of water over your head. Then you see it. It is thrown into a pile of what looks like trash. But, you know it isn't trash (at least not to you). It is just what you have been looking for. So you pull it out and lug it over to the auctioneer. Excuse me, are you going to auction this off. He looks at you like you are crazy and then says yes. Okay, that was my first mistake and as I am no rookie to auctions I know that I should have said , are you throwing this out. Then he may have said yes and I could have walked away with it for free. Of course there was some other lady who recognized it for the jewel that it is and bid against me. Fortunately for me she wasn't that enamored with it and I was able to walk away with it for fifteen dollars. Oh happy day!!! Oh happy Day!! So it sat around for awhile until I decided where I wanted it to go. Then when I decided to make some spiffy new changes to my bathroom, I knew it was perfect. 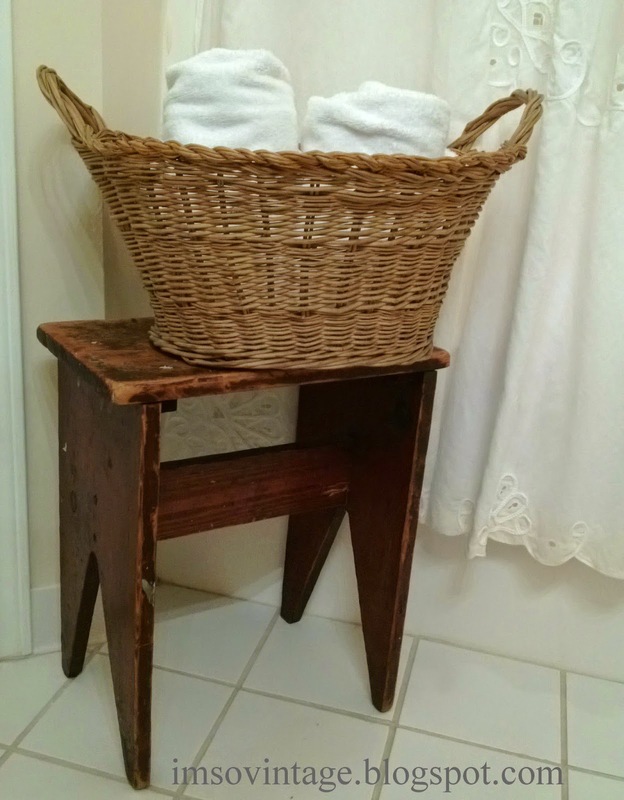 You remember the stool and basket for extra towels I showed you. You can read about it here. and I really wanted a place to display some of them. Then it hit me. 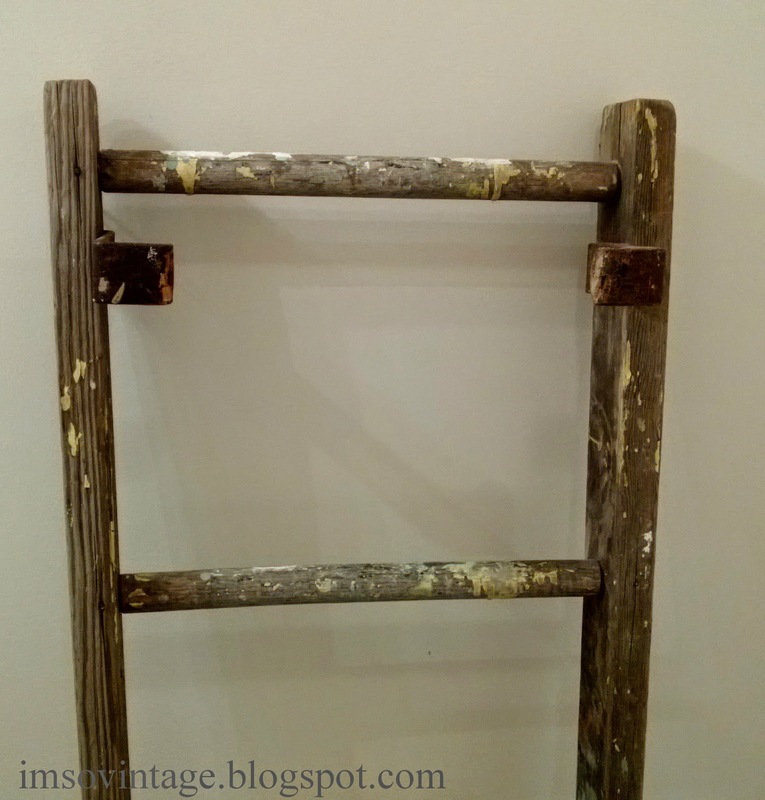 (sometimes I have to smack myself upside the head) Rustic old ladder? Pretty sweet vintage lines? A match made in heaven. And, I had a vacant wall in the bathroom. Once again I stood on my head in the bathtub to get a photo. My bathroom is definitely space challenged. And here it is. I'm definitely loving it and the bathroom decorating is moving right along at breakneck speed a snails pace. Kind of like me. 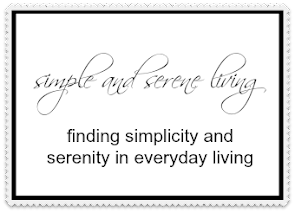 Sharing today with Wow Us Wednesdays, What's It Wednesday, Tweak It Tuesday, and Inspire Me Tuesday. Yes, I am aware that I am a day late for a couple of these, but please refer to my previous comment about the snail's pace. Besides, I wouldn't want to deprive anyone of the opportunity of seeing my wonderful ladder. Oh yeah! I love the ladder! I look for this kind of treasure too! Thanks. I had been looking for one for awhile so I was definitely excited. Thank you, Catherine. I am so sorry about your loss in Hurricane Sandy. It is so difficult to start over, sweet friend. I am on the hunt for one! 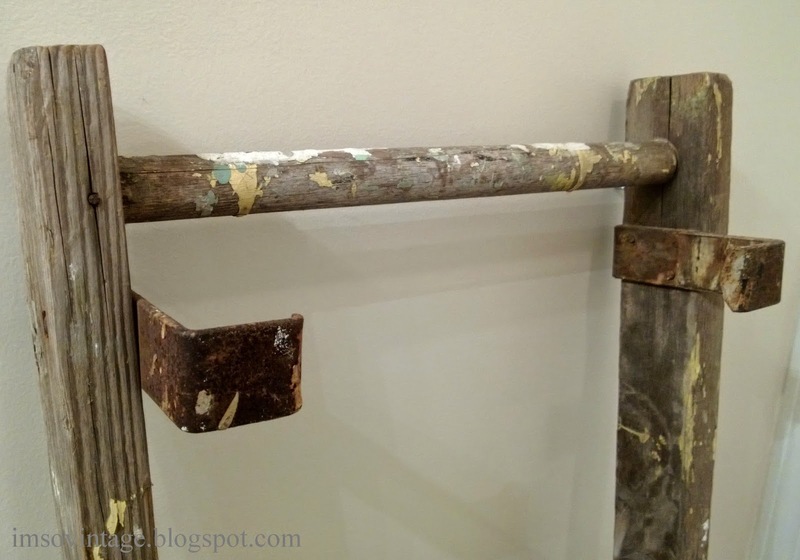 I think this is the perfect way to display an old ladder. And linens! Congrats on your auction win! Good for you! I've been wanting a ladder forever!!!! Great find, Laura! And I love how you're using it. Thanks, Brenda. It sure made standing in the heat that day worth it. Good Evening Laura, I love a bargain and you certainly managed to 'bag' yourself a bargain at the auction. The ladder is perfect to display your beautiful vintage linens. 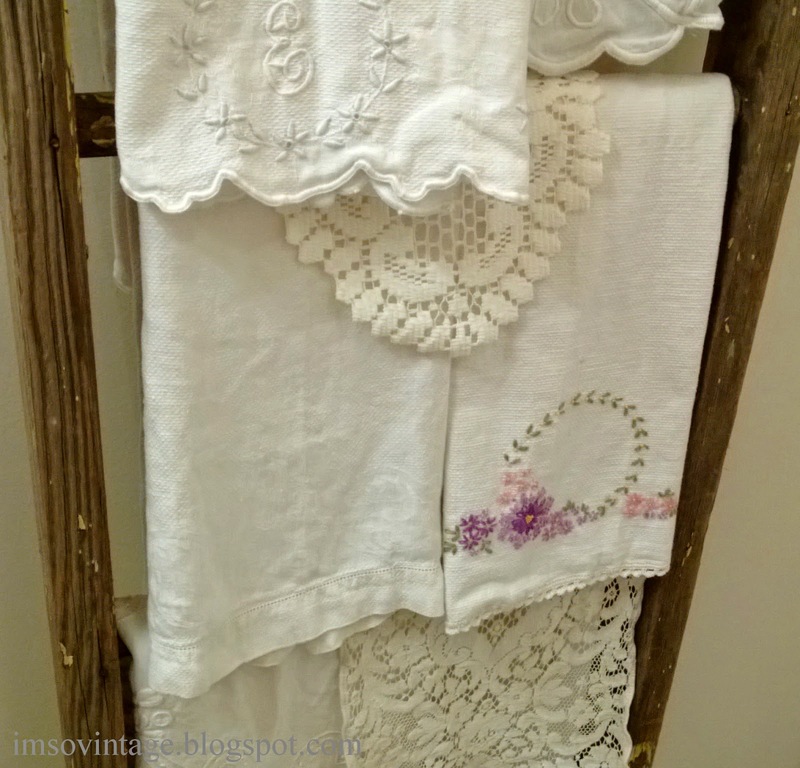 I love vintage linens, I love the beautiful, often simplistic embroidery on each piece. 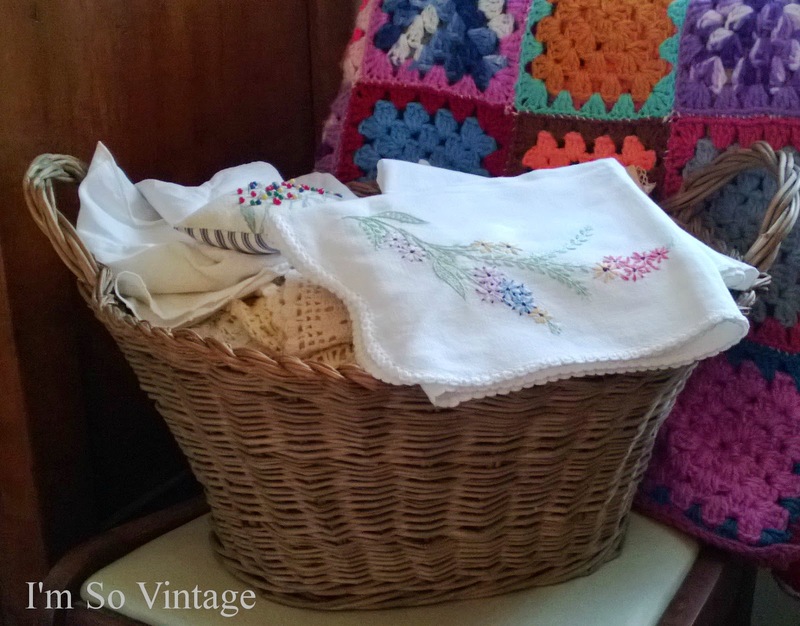 It is the most marvellous feeling to own linen which you know someone else has lovingly embroidered. Enjoy your new ladder..... I'm sure you will keep looking at your linens. I have popped over to visit you from Savvy Southern Style. I have enjoyed my visit so I have become a new follower. That ladder was a bargain. It looks so pretty with your linens! Thanks Diane and I will probably rotate my linens some on it. I really like that idea a lot! It was fun, Susie. Hot, but fun. What a great find!! It looks great with the vintage linens! Good find! Oh the ladder is perfect and much better then a bucket of water on your head! Love the linens on it. I have a tiny bathroom also and understand the photo challenges! I kind of forgot about being so hot when I got the ladder. It is definitely hard to take photos in the bathroom. I love the old ladder you found! 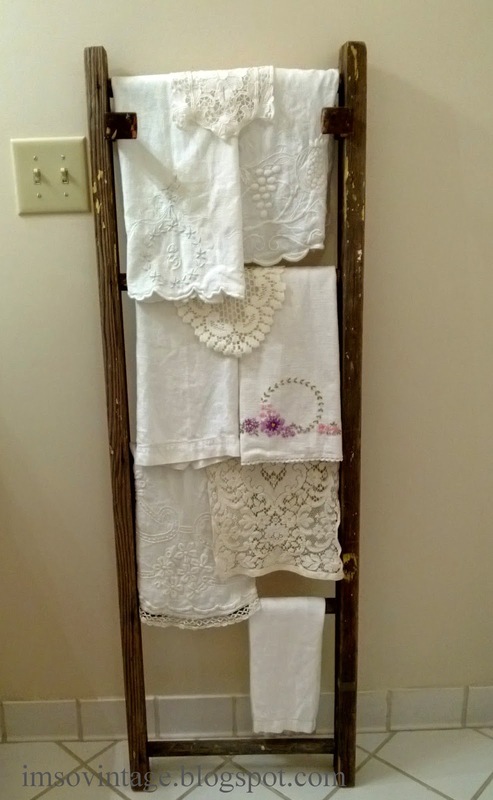 It looks great in your bathroom with all of your vintage linens on it. What a deal too.